The Barr House is a small Contemporary Home, just the opposite of the other houses on this Private Family-owned 40-acre Woodland Estate. But it offers the same 1/3 of a Mile of Shoreline with Tidal Pools, and miles of Paths and Trails to explore. Play tennis on the Clay Tennis Court, swim from the Rocky Shore below or walk to public Beaches. 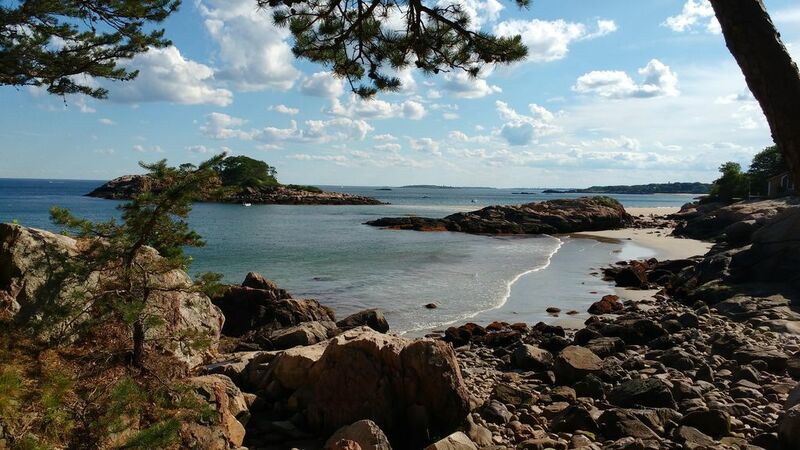 Located 2 miles outside of downtown Manchester-by-the-Sea and just 30 miles north of Boston and is easily accessible by water, train or car. A great little getaway which offers Floor to Ceiling Glass Walls overlooking the Ocean. The house is Fully Furnished, 1 Bedroom with a Queen and 1 Bedroom with 2 singles. Large Living/Dining Room with Fireplace. Fully equipped Kitchen, with dishes, pots, pans, Weber Grill, separate Laundry room with Washer and Dryer, plenty of linens, Free Wireless Internet, 1 and 1/2 Baths, Deck off the Living Room and Bedrooms overlooking the Ocean. Your own Little Retreat in the Woods on the Ocean! We rent Friday to Friday during the Summer season and then rent this home as a 9 month Winter rental. Our rental period during the Spring/Summer is Friday to Friday.